Charlie came two weeks “late.” And five weeks after I had my first major set of contractions. The summer just dragged on and on, while our hopes of a late-June baby turned into hopes of a July 4th baby, and then into hopes of a baby before summer’s end. I felt like I might just be pregnant forever, and got to the point of dreading the next batch of contractions because I knew it most likely wouldn’t bring a baby. Although I tried a couple natural ways to bring the baby, and walked every day, David and I decided to just let this third baby come in her own time, rather than in our time. We just enjoyed our last moments as a family of four and waited. Finally, one morning I woke up around 3am with strong contractions. They were inconsistent, but strong enough to make me uncomfortable. By 5am I couldn’t sleep through them, so got up and read on the couch. Every ten to fifteen minutes I’d have another, but they didn’t get stronger or closer together. After several hours I called Marlene and she said that I should try to sleep and eat a little. She also suggested that I go see Jessica and have her do some labor-inducing acupressure (not acupuncture… needles and I don’t get along!) and massage. I called my mom and she came to pick up Natalie and Felicity so I could get some rest. Then Jessica called and offered to come by and work on some labor pressure points for me. She came soon after and massaged my ankles, hands and lower back. It felt incredible, and I kept having those steady contractions, even with the distraction of talking and laughing with her. Every time one came I was surprised because I was certain they’d peter off and I’d never get to meet my baby! Around 1pm, I suddenly got my appetite back and had a craving for pizza. So I ordered one and ate the entire thing. At that point my contractions started spacing out, though they stayed strong, so I called Marlene and informed her that I was going to take a nap, and I wasn’t sure if I’d be seeing her that night. I lay down and dozed for a little while. Around 3:20pm I suddenly wakened with a double batch of serious surges that I couldn’t relax through, even while breathing deeply. So I got up and went to the bathroom. I had a desperate desire to not be alone anymore so I texted David and asked him to come home sometime soon. Should I leave work at 3:30 or 4? came his reply. He was home in ten minutes. I went out into the kitchen and called Marlene. She didn’t answer so I left a desperate-sounding, probably nearly-incoherent message. I started worrying that she wouldn’t get the message, and I needed her with me, darn it! As soon as David got home I demanded that he call her so he did and thankfully she was just next-door, so arrived with everything by 4pm. As soon as David got home I stopped my anxious pacing and was able to relax better. I knelt down in front of the couch and rested my upper body against it. David walked around, putting blankets over windows and lighting candles. Marlene came in with her comforting presence and quietly set up, and Jessica arrived not much later. I didn’t feel the need for Marlene to check me, because I knew this baby was finally on the way. I did ask her if she thought I was in labor and after watching me breathe through a surge she chuckled that she had no doubt. My first two births had a sense of a surreal dream to them. I lost track of time frequently, and patches of what happened are completely lost to my memory. This birth, however, was different. I felt clearheaded and with it the entire time. Between contractions David and I discussed names. We tossed out the ones originally on our list for both boys and girls, and came up with brand new ones. Marlene and Jessica just kind of watched and stayed a bit out of the way; I could hear them talking quietly once in a while. Each contraction was strong, and I moaned through them. Marlene reminded me to breathe deeply and asked if it would help to move around. No, I can’t relax my muscles if I’m moving. So I stayed in the one position. I heard Marlene murmur to Jessica that I was either at the very beginning of labor or at the very end. Suddenly I started crying. I gasped to David, I can’t do this. I got scared and thought that this has to be the beginning of labor and I knew I couldn’t do it all night! My emotions were completely unmanageable. I tried to control myself, but kept crying and felt totally trapped and alone. Marlene reminded me feelings like those mean that the baby is coming soon. My logical part knew that she was right, but that side was completely taken over by the illogical, emotional hormone surge of transitional labor. Right after that I started pushing a little bit with each surge; it felt right to do so, though it wasn’t an overwhelming urge yet. You’re pushing, aren’t you? Marlene said, in more of a statement than a question. She and Jessica immediately finished setting up, and got the birth stool ready close behind me in case I wanted it. I stayed there at the couch a little while longer, then asked for the birth stool because my legs got tired of half squatting, half kneeling. Everyone helped me up, and I got comfortable on the stool. I asked Jessica for pressure on my lower back, and it felt good to have the tension there with each contraction. Marlene had the warm compresses on my perineum, and I could feel the baby move down. Everything felt right. I felt like I was in the exact position my body needed to be in and I was completely comfortable with the three people there. There was no insecure feeling about it still being daylight. Our little basement apartment felt secure and homey, and I was surrounded by people I trusted and who trusted in my ability to give birth in the best way for my body and my baby. David sat close and encouraged me, but barely touched me at all. It was almost like he didn’t want to disturb me while I was tuned in to my body. Or maybe he just didn’t know how to help. Marlene gently reminded me that I had the option to catch the baby if I wanted to, and I nodded. Yes! I want to! I moved my hand down and felt the bag of waters bulging over the baby’s head. Marlene commented that my water hadn’t broken, and the bag was slowing me up. She said I could push against it with my finger each time I pushed the baby down to try to break it. I did, and it finally broke and the baby’s head pushed out. I felt hair and a tiny little face. Marlene told me to pause for a moment, and she quickly un-looped the cord from around the baby’s neck. Later she told me she wanted me to be able to bring my baby straight to my chest at the moment of birth instead of having to wait for her to untangle us. Okay, she said, now you can push. I did, and suddenly that little baby was cradled against my chest. I honestly have no idea of the mechanics of how I brought that squirmy, wet little baby from birth to chest; it’s as though instinct took over and I just did it without thinking at all. I started laughing and crying and saying you’re so beautiful! over and over. David jumped up and started pacing, saying That was amazing. Oh my gosh that was crazy! What do we have? Is it a boy or a girl? Holy cow that was incredible! I tried to look a couple times, then finally said we have a girl! And David got even more animated in his pacing, saying Another girl! Holy cow I can’t believe it! Oh she’s so beautiful; Babe you were awesome! I can’t believe it! Our baby was crying, kind of a sputtering cry because she had a little fluid in her lungs from birth. She kept coughing and cleaned her lungs out herself. Marlene didn’t suction, just checked our new daughter while I held her, and none of the four of us could believe how small she looked. I had been convinced that I was going to have an eight-pounder at the very smallest, because of how late she was and how huge my belly got. We laughed that it was a good thing she didn’t come five weeks earlier! She knew what she was doing by staying in there so long! 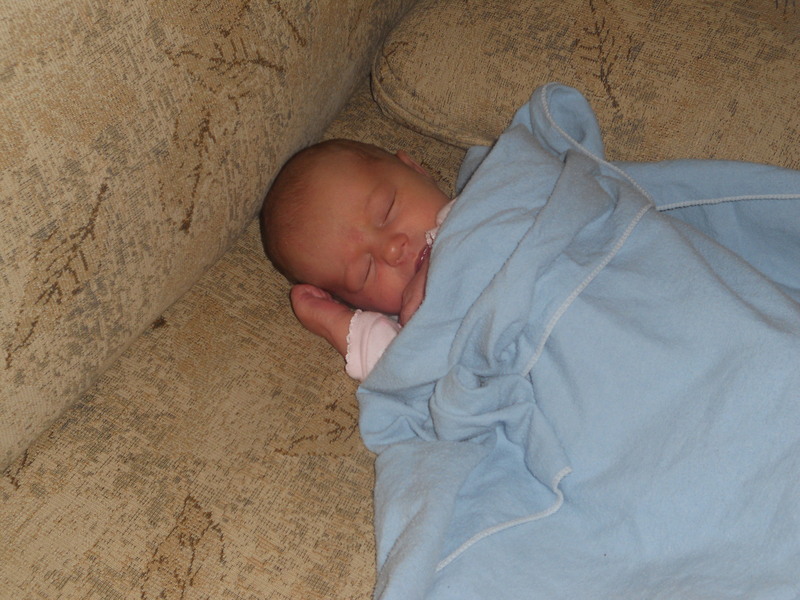 I was helped to the plastic-covered couch, so sat there holding our baby and watching David, who could not sit still. I had started calling the baby Charlie right away, because it seemed to fit her and that was the name David had brought up during labor. After possibly-Charlie has suckled a little and the afterbirth was born, I went to sit in a warm bath for a few minutes alone in peace while Marlene and Jessica did all the weighing and testing and David got to hold his daughter for the first time. Charlotte Jane was born Tuesday, July 12, straight into her momma’s hands. She had dark hair, chubby cheeks, and dark brown eyes.